Looking for how to make a fire pit? Get inspired by these cool homemade fire pit ideas & do it yourself. Brick, in ground, square DIY firepits & more. Fire is magical, practical, and heralded the birth of civilization. No wonder we feel so drawn to it! Sitting around a outside fire is an ancestral memory, embedded in our DNA. The hearth IS home – the first living room, kitchen, and entertainment center. Today, a backyard, deck or garden featuring a fire pit becomes a natural source of conversation, contemplation and community. It’s a ring of warmth, comfort and family that you can build practically any place, at any budget. Whether your tastes are modern, classic, eclectic and whether you are a master DIYer or a novice, you can find some fire pit ideas that will warm your heart. Of course, always research and obey any local regulations on back yard burning or fire codes when you build your dream fire pit. Keep in mind that you might need a windbreak if your space has a strong crosswind. You’ll also need to plan for and manage any smoke produced. Otherwise, your homemade fire pit can be a hole in the ground, an upcycled washing machine drum or flowerpot, or a host of other possibilities limited only by the imagination. Let’s start with unique and simple – my two favorite qualities, personally. Quite a few of these can also be used on a table top, as centerpieces, or in multiples scattered around your backyard for parties. Each project also has an approximate dollar cost as well as time to complete; the evaluation of difficulty is based on a scale of 1-10. Of course, the accomplished DIY pro could certainly make most of these without blinking an eye and in even less time. This DIY fire pit is beautiful, unusual, and easy! Turns out, the design of a washing machine drum is perfect for containing a fire, because the small holes allow oxygen in and light (and heat!) to escape. To make it a little fancier, or if you want to lift it off a surface – such as a wooden deck – you have the option to add welded feet. For tutorial, check out House and Fig. Time: a few hours at most. File this one under “looks harder than it is” also. (My personal favorite kind of project). With a few glass panels, some silicone glue, fire pit rocks and gel fuel, you can have an indoor or outdoor piece that is a true conversation starter. Stay away from tempered glass, and you’ll be just fine. Learn how here. This one is beyond cool. It takes a tiny bit more time and expertise than the first two, but still very doable with a halved whiskey barrel, some aluminum flashing and high heat spray paint. 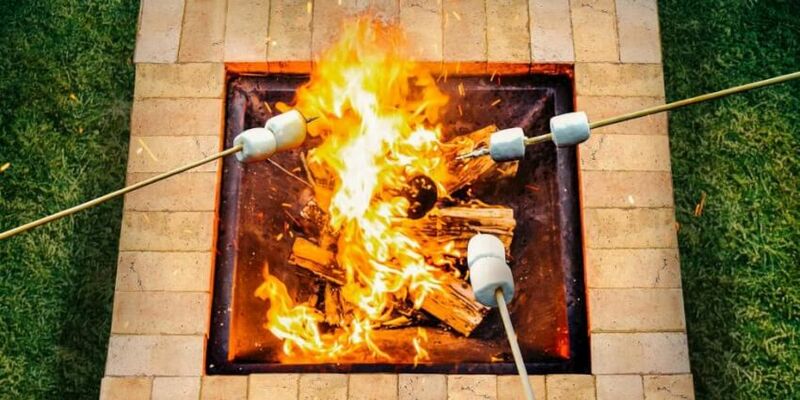 Add your fire bowl on the inside and remember the marshmallows! Click here for the tutorial. We’re back into the dead easy, and potentially killer cute, fire pits with this one. Considering how inexpensive flowerpots can be, and how decorative, this is a great candidate for making a whole fleet of cool fire pits for deployment at a special event or around a pool. See instructions here. Time: Less than an hour a piece. You can consider this a cool, steampunk variation on the flowerpots. All it takes is a 15 gallon wash pail, a few bricks and Duraflame logs. It’s another wonderful option for outdoor evening parties or special event. Details found here. Time: Less than an hour. If you can’t use any of the backyard fire pit ideas, here is a terrific table-based version. It starts with a fire bowl, encased in a DIY stylish Adirondack table. Using simple lumber fence boards, form a hexagonal shape and screw together the joints. Stain, add fire bowl, and send the party invites. You can plan on using this one quite often! 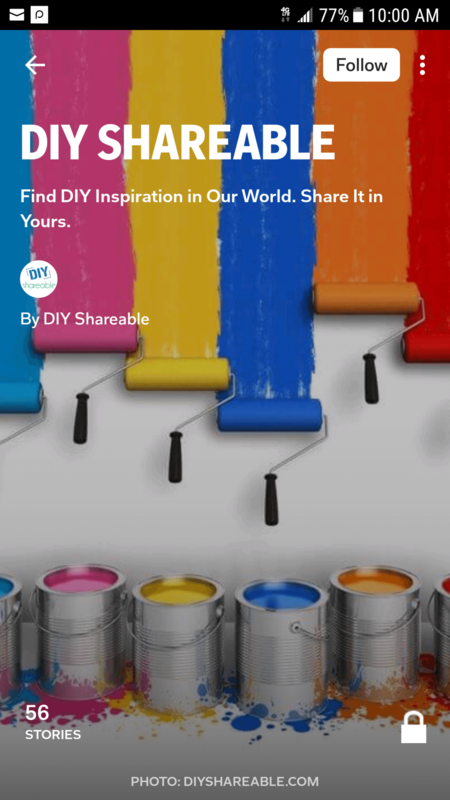 See the tutorial at Interior Frugalista. Make an Olympic-flame-like centerpiece for any event. This one requires a little more skill in execution. But for a showpiece bit of fireproof modern art, it’s worth it. All you need are a good-sized bowl for shaping the mold, concrete, and a bit of patience. See more details here. So you’ve got your cast concrete or metal fire pit bowl, and you want to take it a step further. Or you discovered you just really love to pour concrete (who doesn’t?). With a few wood boards you can build an entire square concrete form to house your boss bowl. Add some gravel at the bottom and decorative rocks around the bowl and you’ve got an amazing feature that will last for years. You have your pick of colors if you choose to buy concrete retaining wall blocks. You might be able to find large, flat stones for free at a quarry, a river or on your property if you’re lucky. Then build the pit around a steel or concrete bowl. There’s no mortar required – the trick is stacking the blocks correctly. Depending on the size you want, anywhere from 30-80 blocks will do the job. Find the details here. Here’s what possible if you are lucky enough to have free rocks on your property! This fire pit cost absolutely nothing but a little time. This is probably as close as we will ever get to how the first hearths were built – fitting and stacking available rocks to make a secure container, then simply burning any layer of grass away with the first fire. Learn how here. Essentially a variation on the concrete block theme, incorporating the circles that are used for flower beds at the bottom of trees as your base cuts down even further on time, cost and difficulty. The only other things you will need are a grill or equivalent to actually insert in the rings, and some gravel or decorative rock. Click here to find out how. Whether you’ve ever laid brick before, or simply always wanted to, this fire pit will end up looking great. Once you’ve laid the concrete base, built the brick circle and mortared it in place, you’ll have that’s maintenance free, easy to clean, permanent highlight in your backyard. There’s a step-by-step tutorial here. Call this the stealth fire pit variation. It’s entirely dug into the ground, with a concrete poured base and stone sides. You can even add the charming touch of family handprints and signatures to the bottom if you’d like! Instructions found here. Let’s say you want to weld… of course you do! This project breaks down an inexpensive outdoor metal table, then fuses a metal fire ring literally into the center of the table. Perfect for roasting marshmallows while sitting comfortably! Check out a step by step guide here. This one is on the higher end of cost and difficulty level, but if you love a challenge, have the time, space and finances, embark on this class fire pit circle laid into a trench lined with gravel. You’ll need a full kit of tools, including chisel and brick hammer, as well as materials like bricks and concrete blocks. Take the time to lay the circle out perfectly as a small gap at the beginning can result in a huge problem at the end. Instructions here. When you want a Big Kahuna of a project, this is it – build an entire patio to showcase your DIY firepit. Start by digging a circular hole the size of the desired patio, add crushed stone and stone, then paving stones. Fuse it together with a fine paver-locking (polymeric sand), that has a flexible glue activated with moisture. Dig into the project here. Circling back to finish with unique, this is an amazingly creative fire pit without any fire at all. It’s terrific for an indoor centerpiece or a teen’s room, and is made up of twigs, aluminum foil; lace hardened with glue, and small string lights. Details over here. One last bit of reading material, purely for a laugh. Entitled “Why It Took Me Five Years to Build a Fire Pit,” this piece at Popular Mechanics will ring true with everyone who has embarked on a project that went a little longer, and got a little tougher, than expected. It’s also a great tutorial for on how to make a square fire pit, including an evaluation of how the project “coulda woulda shoulda” gone better. Ah, 20/20 hindsight! Keep in mind: your top priority (aside from s’mores) is safety. Make sure you find out and follow your local fire codes, keep a hose and/or buckets of water nearby for emergency dousing, maintain a sharp eye on any children, and never leave a fire unattended. With “do it yourself” fire pits this enticing, I don’t think you’ll want to, though.